Venezuela's self-declared interim president Juan Guaidó on Friday called on the military to recognise him as the country's leader. Speaking in Caracas, Guaidó promised to reverse several of Nicolás Maduro's policies and decisions, which included the reopening of Radio Caracas Television network and allowing humanitarian aid into the country to alleviate the ongoing economic crisis. "Venezuela suffered through the nightmare and anguish of a country that was forced to live in submission," he said. READ MORE: Who is Juan Guaidó, the self-proclaimed interim president of Venezuela? Appealing to Venezuela's military and the international community, Guaidó asked for recognition as president. "This must be recognised by the military forces, this must be recognised by the international community," he said. With the country's economy disintegrating and annual inflation approaching 2 million percent, Maduro has relied heavily on the military to maintain power. 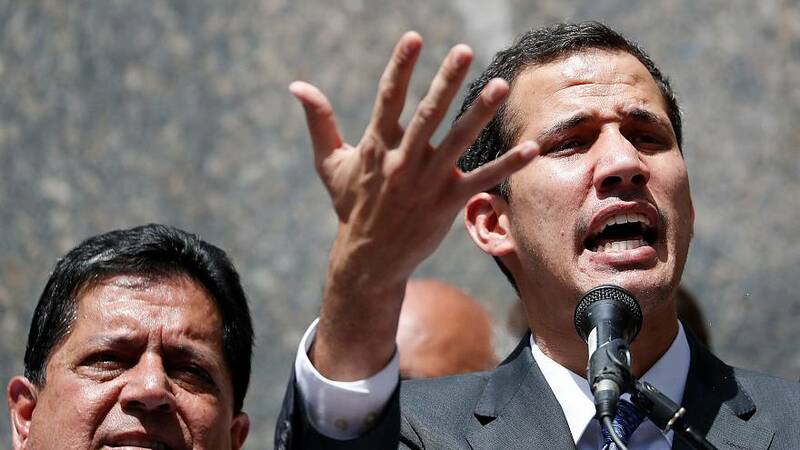 "I want to insist in this message to the armed forces, the time has come to put oneself on the side of the constitution, to put oneself on the side of Venezuela," Guaidó said. "In the next few days, you will have some important tests: the first with your conscience and your family, the second with all those who suffer from hunger. Are you going to allow the passage of humanitarian aid?" Maduro has so far remained defiant, calling on the country's military to maintain unity and discipline. Venezuelan Defence Minister Vladimir Padrino said via Twitter on Wednesday that the country's armed forces disavow any president who is self-proclaimed or imposed by "dark interests."